I did my graduation in Fine Arts with a specialization in painting and pottery. I am into colours, compositions and visuals. These are the basics for possessing creativity in graphics. I did a course in animation and visual effects. I came to Hyderabad and formed a company called FireFly. We got an opportunity to do graphics work for Anji film. Those graphics were supposed to be executed by somebody else. Shyam Prasad Reddy was not satisfied with that work and came to us with two reels of footage shot on blue mat. Visual effects should be integrated in the script and the visual effects supervisor has to be involved and should be at the shooting location when the related scenes are being shot. I always suggest the option of having an alternative scene for graphic shots. For example, while working for Sekhar Kammula’s Godavari film I asked for all the scenes involving dog to be shot in two ways (one is for graphics and one without graphics). In that way, we always have a back up. We did our maximum to Anji film. We pulled off the graphics work in Anji film by working for eight months. A lot of hard work went into it. I am glad that it won National award. We worked for over 20 films including Chatrapati, Tagore, Godavari, Samba and Style. 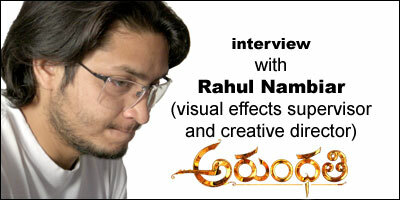 Shyam Prasad Reddy came to me and asked me to be the visual effects supervisor for Arundhati film. We wanted Arundhati to be a visual treat by combining technology, camera and story. Shyam is a passionate producer who craves for perfection. For Shyam sky is the limit. He brought motion capture camera from Australia. We also hired technicians who worked for Lord of the Rings to operate motion capture camera. The motion capture crane can repeat the exact movement again. There are many scenes in this film where we juxtaposed dilapidated fort and new fort using the same motion. We captured the new fort with motion capture first and then made the fort old in 4 hours to do the same motion capture on the old fort. We did not have big stars in the film. It was a huge advantage. Since the star cast is small we could make the movie without having any time frame. If we had a big star in our project, there will be lot of pressure on us. Arundhati film was made properly on the terms of technicians. What was the precise reason for two days delay in movie release? EFX (of Prasad Labs) was handling DI (digital intermediate) work. They did not tell the truth till we asked them for it. Finally they told us that 12000 frames of recording was pending. When we got into details, we found out that 47000 frames were to be recorded. It came like to shock to us. We were given a suggestion to postpone the release by a week. If you look at the climax of Arundhati, you can see jerky movements. It is due to the unprofessional work by EFX. Shyam and I slept in Prasad Labs in the last two days. We employed eight people from our facility. We multiplied the recording process by distributing the work in three facilities. Junaid of Prime Focus helped us a lot in the last minute by doing the opticals and recording. We processed 13000 footage in 10 hours of time. The shooting of the movie was completed in November of 2007. We realized that the movie would bomb if we release it like that. Shyam Prasad Reddy appointed me as the creative director for the film in November 2007 and asked me to do whatever it takes. We rewrote scenes. I shot 60% of the final film that is playing in theaters now. I also got involved in editing, sequencing and music departments. We had dates problem of Anushka, Sonu Sood and Sayaji Shinde as they became very busy by then. We added the jejemma song, entire aghora episode, sleek action sequences and process of making the weapon in the second version. 1. Palace collapse in the end. Almost all the CG companies in Hyderabad refused to do it. 3. Villain coming out of Samadhi. Each frame has 40 layers in it. I am of the opinion that visual effects should not dominate the movie. After watching Anji film, everybody opined that visual effects are good. They are indirectly saying that movie is not good, but visual effects are good. After watching Arundhati, they speak about the movie, not about visual effects. There were 140 shots in Drum dance. We removed 90 shots in order to make it crisp. Lots of our visual effects films in India claim that they are working for Hollywood films. But most of our Indian special effects companies are given mundane and boring jobs like wire removal and tracking points. They don’t give any creative work. They use Indian companies to get their manual labor done. I recently started a visual effects company called ‘Tickle Bugs’. We will be taking only work that has creative aspect to it. The next film of Shyam Prasad Reddy will be wrapped up in 7 months unlike his earlier projects. I am going to direct Shyam’s next project. It might be the Hindi version of Arundhati. We are still in dilemma whether to remake it or dub it. If we remake Arundhati in Hindi, it could become another Ghajini with right casting.